Colorado Springs is known for its unpredictable weather, especially for its unpredictable hail. This year in particular has brought one of the most destructive seasons thus far. 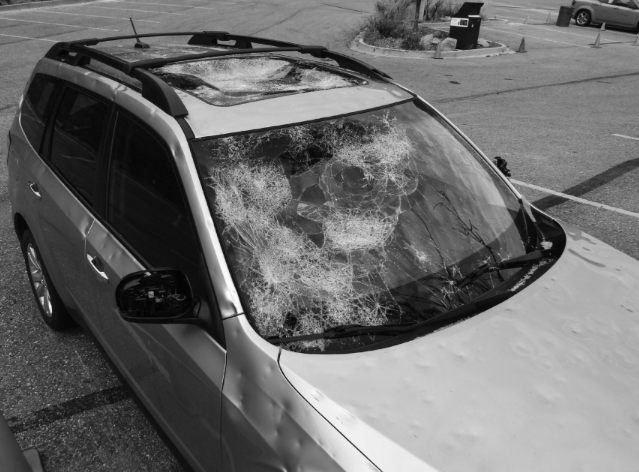 The hail storms that have wreaked havoc on Colorado Springs have been the main source of this unpredictable weather, that not only damages cars and homes, but can also injure people and animals. People in the community have tried to prepare, but with every new storm that comes, the risk of hail is always there, and it’s not always predictable. The hail storm that hit southern Colorado Springs and Fountain on Aug. 6 caused an estimated 172.8 million dollars in damage from insurance claims, according to a news release by the Rocky Mountain Insurance Information Association. “This is yet another reminder from Mother Nature of why Colorado is ranked No. 2 in the Nation for hail insurance claims,” said Carole Walker, Executive Director of the association. The Denver Post reported on Aug. 6 that, as a result of the storm, eight people went to the hospital with hail related injuries and three animals were killed. This raises the question for many of us at UCCS, how prepared is the school in the event of a hail storm that could damage cars, and even possibly injure students, faculty and staff? Scott Smith, the UCCS director of emergency management working in the department of public safety, says that, as a campus, we are very prepared. “It’s not just hail we worry about. We have to take into consideration lightning, heavy rain, [and] wind that can all be damaging to the school,” said Smith. Not only is the campus prepared for hail, but also for weather conditions that may be as severe as the threat of hail. The buildings all around campus are designed and built to withstand these damages in order to protect students and faculty that work and live on campus. All of the weather threats were taken into for the incorporated final design of the campus. Hail damage does not only include damage to windows, roofs and other parts of the buildings, but one severe problem of the aftermath of hail is the run off when it melts. “Around the campus we have runoff systems for storm water management that we have worked on for years,” said Smith. Hail is only one of the many weather conditions that what we must worry about as a campus. The heavy rains, wind, lightning and hail all play into the safety precautions that are taken throughout campus. The runoff around the bluffs is to prevent flooding, since the campus would otherwise flood and cause damage to buildings. The athletic program and Gallogly Recreation Center monitors lightning in the area for outdoor activities. Any activities will cease if there is lightning within 8 miles of the campus. Buildings are equipped with systems protection in case lightning strikes that could cause power outages. “Those are absolutely included. All campus infrastructure and new developments are designed with consideration of aspects, such as the runoff system, position of the building and design form of the building when planning these new buildings,” said Smith in regard to students being involved in hail storm preparedness. The Department of Public Safety is able to track storms from campus throughout the day, and then they are able to inform those who are on campus. They also monitor national and local weather through the app, WeatherBug. Using this app, and their own system they are able to efficiently track the storms and inform others in a timely manner. “We have on campus an emergency notification system, which students are required to sign up with registration staff and faculty as well be informed of any reason. This system can reach in 60 seconds to reach 14,000 people by text message or email to give updates, which is pretty impressive,” said Smith. Smith goes on to inform the El Paso and Teller counties maintain a joint emergency alert system that people can register to get information to their system, and sign up to get national weather notifications. The website is Everybridge.net, and can be found by Googling “El Paso teller county 911.” This will take students to a page to register for emergency notifications. UCCS is able to also see the potential hail percentage and where it will be likely to hit in Colorado Springs by tracking everyday weather. Not only can they determine where the storm will hit, and what percentage, but the chance of the storm and how severe it will be is also made available. This will be beneficial in preparing for potential damage to life and property. These notifications on top of the one UCCS sends to students will help students, faculty and staff be aware of weather situations, as well as other concerns that Colorado weather may bring. The university’s main priority is to ensure that all staff and students are safe when they are on campus.